I've been meaning to review this wine for awhile, but as luck would have it, LIFE HAPPENS. People get busy. Time slips away. 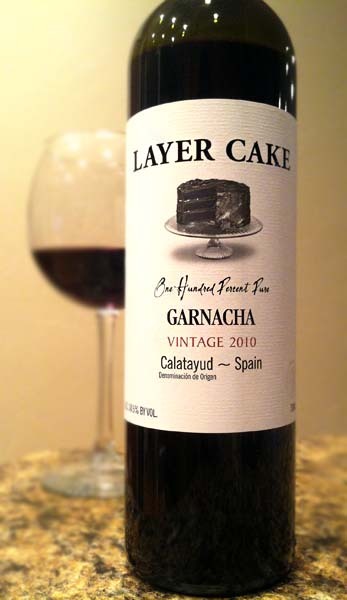 But low and behold, I finally have a minute to write up a formal review for the 2010 Layer Cake Garnacha. If you've read through some of my wine reviews, you'll no doubt notice I've reviewed a lot of Layer Cake wines. In fact, this is the last varietal of theirs I have to review. I've even reviewed a couple different vintages of a few of theirs. And ya' know what? I have yet to be disappointed by any of their wines, especially for being wines under $20. Click HERE to check out all the Layer Cake wines I've reviewed, there are some great ones. Trust me. So, this is the 2010 Layer Cake Garnacha made in Calatayud, which is in central Spain. It pours a deep, almost bloody, ruby red color which is gorgeous. Aromas are of red raspberries and a non-distinct earthiness. Tasting brings a lush bouquet of more red raspberries, craisins, dark roasted coffee, toasty oak and smoked alder wood, with a smooth moderately tannic finish. This wine is another example of the Layer Cake brand sourcing amazing products. This is a wonderful wine and very befitting of red meat. I had a couple glasses with a thick, juicy grilled ribeye. Perfect pairing. Drink This: if you want a great red wine that matches well with red meat. Another great Layer Cake wine.